Martinique and Guadeloupe form a part of the French West Indies, territories governed by French sovereignty in the Caribbean Antilles. Martinique is distinctly French in its cuisine and style, but its culture is all West Indian. The northern part of the island features dark sand beaches, rain forests and mountain peaks, while the southern part of the island is much drier and flatter with magnificent white sand beaches. Known as the ‘island of flowers,’ Martinique features beautiful lush vegetation, fields of mango, papaya and guava, and large plantations of bananas, pineapple, sugarcane, coffee and cinnamon. 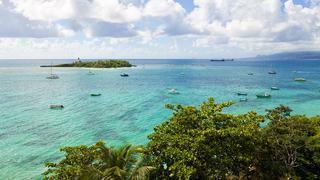 Guadeloupe is comprised of two main islands that look like the wings of a butterfly. Joined together by a bridge over the Riviere Salee, the eastern island is Grande-Terre, known for its white sand beaches, resort areas and sugarcane fields. To the west is the larger of the two islands, Basse-Terre, which is known for its waterfalls, rain forests and its selection of bucket list dives. Superyacht charters in Guadeloupe and luxury yacht charters in Martinique are both popular options and a host of private yachts also visit every year. This five day itinerary allows you to explore both locations over a long weekend. From protected anchorage in Marin Bay or the marina itself, head to the lovely bay at Anse Chaudière. This secluded beach offers excellent snorkelling well off the beaten track. Then make for safe berth at Marina du Bakoua, a favourite among superyachts. 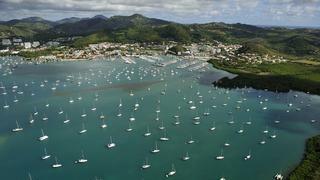 Spend some time in Fort France, Martinique’s capital, just across from the marina. This bustling town displays some grand French architecture (the library was designed by the man who built the Eiffel tower) as well as more down-to-earth fun in the open-air market. Then cruise up the leeward coast to St Pierre, which has great shipwrecks to dive. Ashore you can visit the ruins of the old St Pierre destroyed in the volcanic eruption of 1902. Inland you can cool off in crystal clear river pools and cascades. 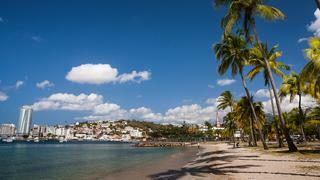 Spend some time in Fort France, Martinique’s capital, just across from the marina. This bustling town displays some grand French architecture (the library was designed by the man who built the Eiffel tower) as well as more down-to-earth fun in the open-air market. Then cruise up the leeward coast to St Pierre, which has great shipwrecks to dive. Ashore you can visit the ruins of the old St Pierre destroyed in the volcanic eruption of 1902. Inland you can cool off in crystal clear river pools and cascades. Heading north on passage towards Guadeloupe, you’ll pass the vertiginous green cliffs of Dominica, and approach the small island group of Les Saintes. Considered the most exquisite in the Caribbean, these diminutive islands are clean and quiet, there are no cars and the only inhabitants are the few descendants of the Breton fishermen who settled here. There is a lovely Auberge on Les Petits Saints, with just a few rooms and gourmet dining in the antique shop overlooking the bay. Heading north on passage towards Guadeloupe, you’ll pass the vertiginous green cliffs of Dominica, and approach the small island group of Les Saintes. Considered the most exquisite in the Caribbean, these diminutive islands are clean and quiet, there are no cars and the only inhabitants are the few descendants of the Breton fishermen who settled here. There is a lovely Auberge on Les Petits Saints, with just a few rooms and gourmet dining in the antique shop overlooking the bay. It’s worth spending some time relaxing after the trip from Martinique exploring these islands on foot. 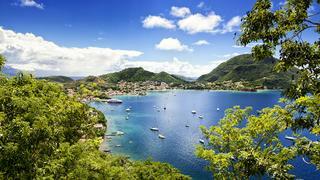 The tiny village of Bourg des Saintes is a delight, with art galleries and colourful Creole buildings. There are breathtaking views from Fort Napoleon, built in 1867, and from the peak of Le Chameau, at 305 metres, the highest point on the island. Only two of the nine islands are inhabited, so it’s wonderful to be able to explore the archipelago from the luxury of your own tender and find a secluded cove all to yourself. With crystal clear water and abundant sealife the snorkelling is fabulous. It’s worth spending some time relaxing after the trip from Martinique exploring these islands on foot. The tiny village of Bourg des Saintes is a delight, with art galleries and colourful Creole buildings. There are breathtaking views from Fort Napoleon, built in 1867, and from the peak of Le Chameau, at 305 metres, the highest point on the island. Only two of the nine islands are inhabited, so it’s wonderful to be able to explore the archipelago from the luxury of your own tender and find a secluded cove all to yourself. 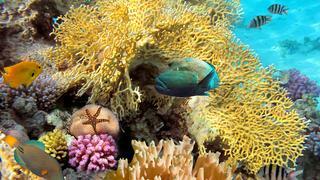 With crystal clear water and abundant sealife the snorkelling is fabulous. If you can tear yourself away from Les Saintes, head to St Francois on Guadeloupe itself. The shallow lagoon here is ideal for watersports, and an excellent place to learn some new skills such as kite-surfing. And for those who prefer less strenuous sports, there is a Robert Trent Jones designed golf course on shore. Yachts up to 58 metres can take a berth at the Bas-du-Fort marina, and enjoy a classic French dinner ashore at the Cote Jardin, one of the finest restaurants on Guadeloupe.